Over the years I’ve realized some movies can be particularly deceiving. For example, just because a film is Disney and/or a cartoon does not mean it is necessarily family friendly, regardless of its intention. When venturing your local video store we see sections divided up throughout, thus helping the consumer find what they are looking for with ease and certainty. Among these sections, for the most part, we have New Releases, Foreign, Music, Sci-Fi, Comedy, Action, Drama, TV, Video Games, Family and Horror. Now I'd like to focus your attention on the last two sections. In the Family section we find Meet the Robinsons, Finding Nemo, The Parent Trap. In the Horror section we find Nightmare on Elm St., The Descent, The Ring, but what about those movies that don’t quite fit in either sections? You will find those movies in the Family section simply because it has the Disney label on it. It seems reasonable, right? WRONG! Sure these movies were made for kids/families and have a happy-go-lucky subject, but below the surface these movies also have a dark and devious underling message of horror and fright. I’m talking about movies that were not meant to scare you as a kid, but unfortunately did. I'm talking about movies that if you were to watch them today as an adult, you’d scratch your head and question; “Wait, this movie was made for kids’ right?” Now these movies aren’t necessarily “scary” enough to be classified as Horror films, but in my opinion, they shouldn’t be strictly classified as Family films either. This is why we need a Family/Horror section in our video stores. I’ve often wonder why this section does not exist and I strongly feel (not really though lol) that this problem should be rectified immediately if not sooner. To prove my point I have made a list of movies that seriously belong in the Family/Horror section, starting with bad to worst. This psychedelic dream world called “Wonderland” was cute for the first 5 minutes, right before the film proceeded to take us on this topsy-turvy, acid trip adventure ride. Will Alice ever find her way home? With characters such as the ever so confusing/creepy Cheshire cat, with its sheepish yet devilish ear to ear grin, the grumpy talking, pot-head caterpillar, and the borderline personality, Prozac-popping Queen of Hearts, I certainly hope so! With the most bizarre series of adventures ever, I feel Walt Disney was seriously on crack when making this film. Here we see a seemingly fun kids movie where a poor kid wins the opportunity to tour the most wonderful candy factory ever. Or is it? (pause) I beg to differ. For example what’s with that chocolate-psycho river to hell? (shakes head) What was that creepy tunnel scene all about anyway? There’s nothing kid-like about it. It freaks me out to this day. Let’s not forget those little, orange, creepy song and dance Oompa Loompas either. They’re nothing more than brainwashed little slaves for Mr. Eccentric himself – Willy Wonka – weird-o! First of all puppets are just freaky. End of story. I don’t care how classic and sweet and charming this film is supposed to be, I don’t buy it. This film still creeps me out to this day. For example, Pinocchio’s adventures lure him to Pleasure Island, where he drinks, smokes and almost transforms into a jackass, and then he is forced into puppet slavery where he almost gets chopped up into firewood? Um, what?! This movie was meant for kids’, right Walt? I get the message Disney was trying to portray, but next time how about a little less ‘freaky’ and a little more ‘happy’. Mmm-kay. How's this for a zany, cracked-out plot? A bunch of mischievous dwarfs steal a map from the Supreme Being which shows them how to find holes that lead to various historical periods in time. One such hole brings them to a small boy's bedroom. The boy joins them, and together they visit diverse (to put it nicely) lands. All the while they are being pursued by the Devil himself, who desperately wants to steal the map. The places and things they see on their journey are just wild, creepy, weird and off the wall. BI-ZARRE! I don’t even know where to begin. Who ever said this movie is bright, cheery and happy was clearly out side their mind. This film is dark, chilling, disturbing and managed to get under my skin as a kid and stay there. I tried watching this film again as an adult but couldn’t finish it. There’s just something horrifying about it. The wheelers are the worst - freaky little gang bangers with wheels for hands and feet rolling around with the devil in their eyes. (shakes head) I get chills just thinking about it. And then there’s the Nome King, Jack Pumpkinhead and the shape shifting talking rocks. WTH?! And don’t forget the all too vain Mombi the Witch and her walk in closet full of creepy looking heads just waiting to be picked. (shakes head & shivers) Um, no thanks. What are some of your Family/Horror movies? 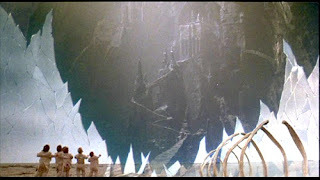 you have it right about 'return to oz', but having said that i think it's one of my favorite movie… ever! i grew up on it and it's still one i love. i'll need to check out number two. what a fun topic to think about. what about dark crystal? or nightmare before christmas? 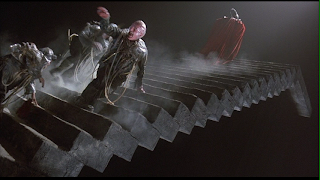 or the witches with angelica houston. I also thought gremlins may kinda fit in this category. OMG! The Witches is an excellent choice. I forgot about that one. It's totally creepy. Good call! I see what you mean with all of those- but I still loved them all. 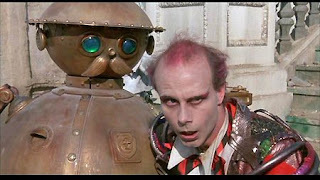 Bingo on "Return to Oz"... If you hadn't put it on the list I would Totally have mentioned it here. Uber-Creep-Fest! I would, however, have to trump (and or Tie) your #1 with Jim Henson's "The Dark Crystal" aka "Stairway to Hell and Back and Then to Hell Again"! WTF, JIM?! Umya. Wasn't Sleepy Hollow originally a kid's story? And how about Watcher in the Woods. WTH was Disney doing with THAT one! you must really think about it. Nothing is truly a "happy ending". If you just show that side kids don't really get the "entire" message. 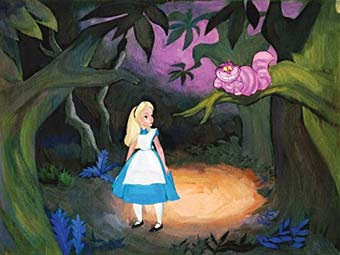 Alice in wonderland was indeed made by a man on acid. But there is meaning behind it, same as other films. some messages kids don't realize till they grow up. It gives them realization. Thus giving them hope that "there might be a journey to that happiness, and nothing may be as they thought". Stories have different roles of messages. Maybe you don't truly understand yourself what they mean. The puppet could simply mean you can be something better without "strings attached". Theres a reason why its "family" orientated...so everyone can grasp there own meaning. My name is Helen Reif I was browsing internet and found your blog. The author did a great job. I will subscribe to your RSS feeds. Thank you for your contribution. I am a web designer myself. And here some examples of the websites that I designed for payday loan canada canadian payday loans company. Thank you for your very kind remarks. I put a lot of effort into it. I like what you did with those websites. Nice work! How long have you been doing web design? Hey, I can't actually understand the way you think. I have seen all of these movies and I think they can offer many profits to kids that these movies refer to. You are an adult and think that possibly these movies teached you that life happiness is rare. 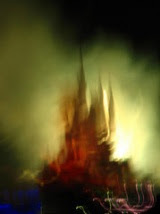 A fairytale' s role is t teach children that they can't find an utopia and they must try very hard for the "happy end".